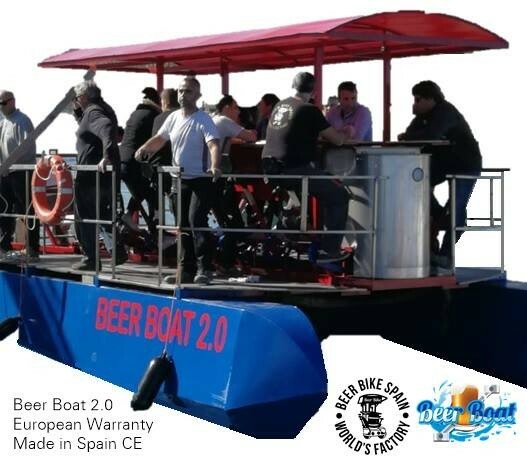 The Beer Boat is a catamaran with beach mechanism rank, made to be driven just with human propulsion. Therefore, it is an hydro-pedal catamaran. 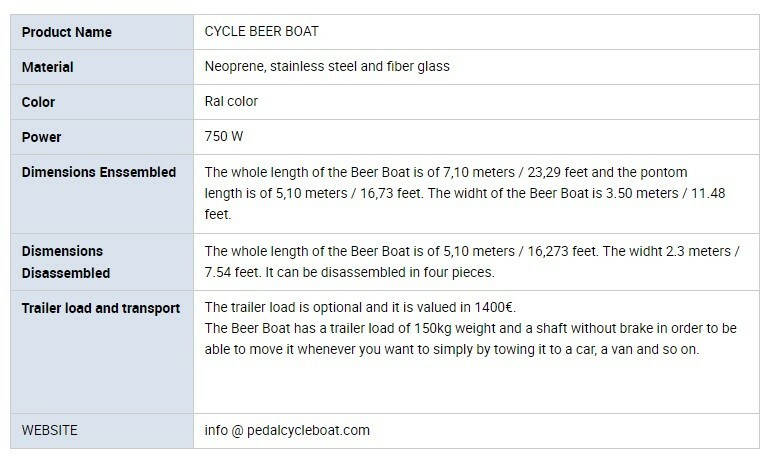 Send us this request to (info @ pedalcycleboat.com)and we will send you your proforma invoice with all costs included. 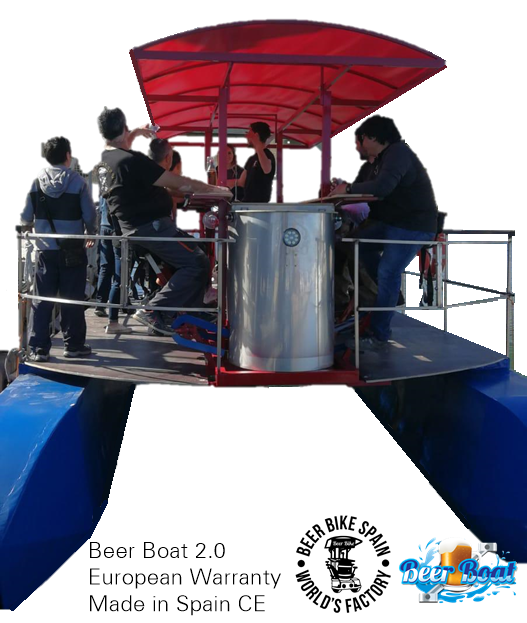 ■ The Beer Boat is a catamaran with beach mechanism rank, made to be driven just with human propulsion. Therefore, it is an hydro-pedal catamaran. ■ The capacity of the boat is of 11 passengers + 1 crew member. It can be for until 18 people depending of the country. - It has two bar tops at the front of each two pedal lines and it could have a watertight compartment between both bars where there is space for two ice-boxes to store ice and drinks. There is also a watertight compartment in order to keep, for example, 12 life vests. ■ Watertight compartment under the steering wheel where there is a powerful speaker of 800w. ■ ENSSEMBLED: The whole length of the Beer Boat is of 7,10 metres / 23,29 feet and the deck lenght is of 5.10 meters / 16.73 feet. The widht of the Beer Boat is 3.5 meters / 11.48 feet. ■ DISASSEMBLED: The whole length of the Beer Boat is of 5.10 metres / 16.73 feet. The widht 2.30 meters / 7.54 feet. It can be disassembles in four parts. ■ The Beer Boat has been designed particularly to fit in a 40 "container. This fact marks down the transport costs letting the delivery to Europe, The United States and the Caribbean at a very economic price. ■ It is sent completely assembled with the exception of the roof. The lateral floats are disassembled in order to fit in the container so it can be filled when it is received. 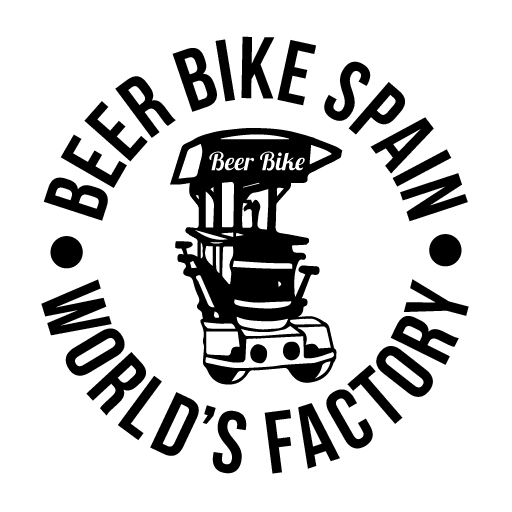 ■ The Beer Boat has a trailer load of 150kg weight and a shaft without brake in order to be able to move it whenever you want to simply by towing it to a car, a van and so on. The trailer load is optional and it is valued in 1400€. ■ In order to launch the boat it is enough with getting closer to a water access ramp and the Beer Boat will float. Then, the trailer load should be moved away. To reef the boat, first the trail load should be immersed in the twater by means of the access ramp and afterwards, to sail until the Beer Boat is positioned on the trail load. Then, the boat should be tied with the winch at the same time we take the trailer load off out of the water. The Beer Boat will be stranded on the trailer load ready to be moved to another place. This allows us to make of our product a flexible and dinamic business adapted to our customers needs, being able to leave from any harbour, nautical club, beach or place with a water ramp access. The Beer Boat is made of stainless steel, galvanized steel, nautical phenolic wood (waterproof) neoprene and PVC sailcloth.